I’ve essentially been using the same computer for the past seven years. For those who care to know, her name is Skuld. I built it using an elegant Antec Sonata II case that I got from Staples on clearance for $90. It is very sturdy, sleek, and made for quiet operation. It originally started with an AMD Athlon XP 1900+ which was later upgraded to an Athlon XP 2600+ and a new motherboard because the original one decided to cook itself. With the occasional upgrade in hard drive and video card (an AGP ATI 9600XT with 128Mb) it has stayed the same computer for the better part of a decade which in the computer world makes it nearly an antique. It still runs Guildwars alright, and any game that came out before two years ago. A couple of years ago I toyed with the idea of upgrading it again, or building an entirely new computer. At that time though I was still trying to pay down my substantial credit card debts and while there were faster processors available they were still quite expensive compared to the small performance boost I would receive so I postponed my typical upgrade spree a little longer. Now that I have my debt under control and I’m finally on top of my bills without worrying about whether or not I’m going to eat until the next paycheck, I once again played with the idea of building a new computer. After Sabrina and I built her a new computer a few months ago to replace her aging (yet still newer than my machine! ), I offered her a friendly challenge. “When you’ve got time, could you find me a new computer case?” I figured she would be busy and wouldn’t have the time or inclination to do that for at least another couple of months. The results? I now have a Raidmax Smilodon Extreme Black ATX-612WEB case waiting under my computer desk. Patiently crouched for innards. Either an unsuspecting passers’by, or the motherboard/psu/gpu/cpu/ram that I’ll have to order soon. I have a feeling it would happily feed on either. It was delivered late last night so I haven’t had much time with it yet. My initial impression of it is that it is a very solid case. It’s also big. I thought my Antec was rather large, but this is about another 3/4″ taller and at least an inch and a half wider. 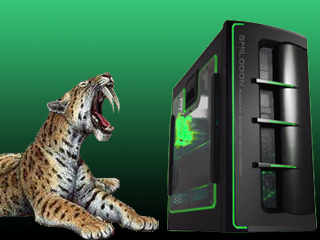 And while the Antec had a quiet subtle beauty to it, this Smilodon looks like it craves action. I can’t wait until I order a power supply and plug the thing in and listen to it purr! I’m also afraid that if I don’t feed it soon, it’s going to carve its dinner out of my calves which are unpleasantly close to it when I sit at my desk.